Martorell, February 2016. – After winning the World Rally Championship in 1996 in the 2-litre category with the Ibiza Kit Car, SEAT decided to pursue one of its proudest genetic traits even further: passion for competition. Such passion gave rise to the CUPRA concept, a revolutionary initiative to provide customers with a road car that delivered true sports car (in English, sports car is a road car…) performance. And the name it was given aptly combines two concepts as Cup and Racing in a single word. From that moment on, the CUPRA models fully represent the sporty nature that has always characterised SEAT. In 2016, coinciding with the launch of the new Leon CUPRA 290, this commitment is into its twentieth year, and could not come at a better time. New additions to the CUPRA family, such as the 192 horsepower Ibiza CUPRA 1.8 TSI in 2015, have stayed true to the CUPRA formula– dynamic handling, maximum performance, attractive design and above all, strong emphasis on sportiness. According to SEAT President Luca de Meo, the CUPRA concept has become "synonymous with sporty essence, something that is an integral part of our company's identity. When sitting at the wheel of a CUPRA, customers truly know they are handling a car with unrivalled performance. The cars that have heralded this concept over the years are the best evidence that SEAT has managed to stay true to this commitment, and will continue to do so in the future". For SEAT Vice-president for R&amp;D Matthias Rabe, "the CUPRA version is our company's finest model, a true icon and the ultimate expression of the values that have characterised us since the beginning: excitement, performance, design and comfort. We have been loyal to these values for the last twenty years, and believe that CUPRA contributes to our brand with visibility and results, making us especially appealing to customers worldwide." The first CUPRA generation saw the light in 1996. 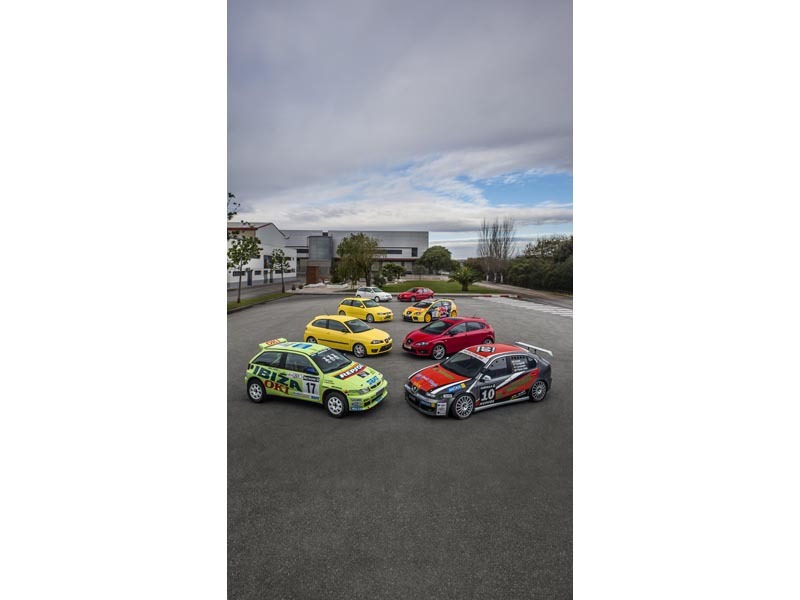 The previous year, the Ibiza 1.8 group A posted encouraging results at the World Rally Championship, leading SEAT, in keeping with the racing tradition that had produced so many successes since the 70s, to develop a revolutionary model: the Ibiza Kit Car. Equipped with a 2.0 engine that delivered 250 horsepower, it surprised the other teams at the championship with its high-performance, reliable engine, which responded perfectly in races held on both paved and gravel roads. The SEAT Sport team participated in eight events, and after securing one victory (Portugal) and six podiums, was crowned champion in the 2-litre category. It was the first world title for a Spanish brand, a milestone in the history of national motorsport. The importance and ambition of the project that SEAT had initiated did not end on the racetrack. At the same time that they were developing the Ibiza Kit Car, SEAT Sport had also been working for months on its "twin brother" roadcar version, the 150 horsepower Ibiza 2.0, the first to carry the CUPRA badge. The idea of combining the racing performance and know-how into a car rolling off the standard assembly line was highly applauded. The Ibiza, launched in 1984, had become a true social icon in Spain, resuming the legacy of the legendary SEAT 600. The Ibiza had connected especially well with young drivers and became the most sought-after car. SEAT decided to act on that potential. Among young people, or simply fans of sporty driving, the performance of the Ibiza 2.0 had tremendous appeal. It accelerated from 0 to 100 km/h in 8.3 seconds and reached a top speed of 216 km/h. It was a safe car and reliable in any situation. Jaime Puig, director of SEAT Sport and inextricably linked to the CUPRA project practically since the beginning, says that "the first CUPRA was aimed at a younger public, eager to have a high-performance car that would respond with the power and handling of a sports car in any situation. To achieve this we relied first on the Ibiza, followed by the Leon, enabling us over the past twenty years to keep surprising our customers with every successive launch". The success of the CUPRA models is due to the constant commitment to perfection and for developing and implementing the most advanced performance-boosting technology. In this sense, the work carried out jointly by the SEAT Sport and Technical Centre teams has produced significant achievements. In 2000, SEAT launched the second version of the Ibiza CUPRA, equipped with a powerful 156 horsepower 1.8 20VT engine displaying the new image of the Ibiza. In addition, it featured ESC (electronic stability control), a pioneering system in a vehicle of its kind. The SEAT Leon joined the CUPRA family that same year. It was equipped with all-wheel drive and a 2.8-litre V6 engine that broke the 200 horsepower barrier in a production car. These achievements placed the CUPRA models at a distinct advantage compared to their immediate rivals. The company's commitment to the CUPRA concept extended to other SEAT models. That same year, the 156 horsepower Cordoba CUPRA 1.8 20VT made its debut, in an ambitious attempt to provide customers with a road going version of the SEAT Cordoba WRC, which had competed in the top category of the World Rally Championship for three years. SEAT closed 2000 by surprising the international press with the presentation of the 180 horsepower Ibiza CUPRA R 1.8 20VT at the Birmingham Motor Show. It was the first to sport the letter R after its name, demonstrating its unmistakable distinction as a pure bred hot hatch. Only 200 units were built and it paved the way for the production of further limited runs from the Spanish brand.. The first Leon that was prepared by SEAT Sport was the CUPRA R in 2002. The Spanish brand's motorsport division worked diligently on achieving greater efficiency, and its 210 horsepower 1.8 20 VT engine guaranteed exceptional performance in any situation. A year later saw the arrival of an even more powerful evolution boasting 225 horsepower. Starting in 2006, the CUPRA models were integrated under the leadership of the Technical Centre, leaving SEAT Sport to manage all aspects related with vehicles intended for use in competition, as SEAT had returned to motorsport in 2002 when the one-make Supercopa SEAT Leon series was set up. Developing a CUPRA model is a transversal project that includes every division in SEAT. Each area works like clockwork to put the original idea into practice – achieve a production model that delivers the exceptional performance of a competition model. The continual additions to the CUPRA family have always been well received by the motoring press, both in Spain and the rest of Europe. Critics have praised the constant technological contributions, improvements in the driving experience and achievements such as the fantastic diesel engine of the 160 horsepower Ibiza CUPRA 1.9 TDI from 2004. The CUPRA concept made the biggest splash in its twenty years with a historical feat: on 18 October 2014, the Leon CUPRA Performance Pack, with SEAT driver Jordi Gené at the helm, smashed the lap time record by a front-wheel drive production car on Germany's legendary Nürburgring Nordschleife track. The final time of 7:58.44 honoured all the hard work put in by a team of up to 15 people, including mechanics, engineers and support staff. Everything was meticulously thought out down to the smallest detail, such as eliminating all unnecessary weight without affecting the car's stability, enabling it to reach 242 km/h on the Tiergarten straight. The genuine production car was equipped with the standard 2.0 TSI engine of the Leon CUPRA 280, upgraded high-performance Brembo brakes, exclusive 19-inch lightweight alloy wheels and high-performing Michelin Pilot Sport Cup 2 tyres. The European press reacted to the news with a mixture of surprise and admiration, and SEAT won the full respect of all racing fans. But, SEAT and the CUPRA concept continue to carve out racing history. In 2015, a Leon ST CUPRA, again with Jordi Gené at the wheel, lapped the Nürburgring even faster than its smaller sibling, with a time of 7:58.12. With this result, SEAT offered its customers the fastest production estate car on the market. After twenty years of technical and sporting achievements, the CUPRA concept is continues to move forward. The 2016 launch of a car with such exceptional performance as the Leon CUPRA 290 is proof that the heritage is more alive than ever.